This tutorial demonstrates how to use Replace Bookmarks With Text	step from Data > Documents	category in the ToolBox	. 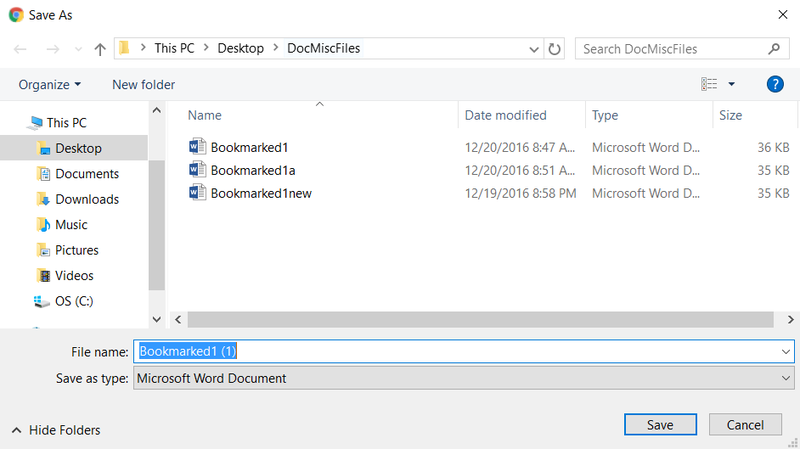 This step gets bookmarks from the Constant Word Document , replaces them with a desirable Text , and returns an updated Document File. 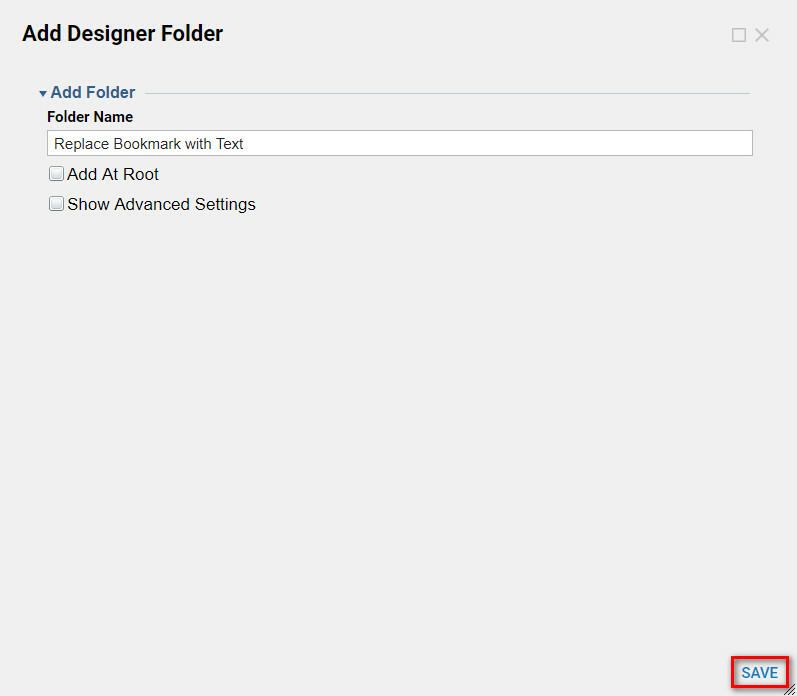 We begin in theDesigner Folder by clicking Create Flow	on the Folder Actions panel. 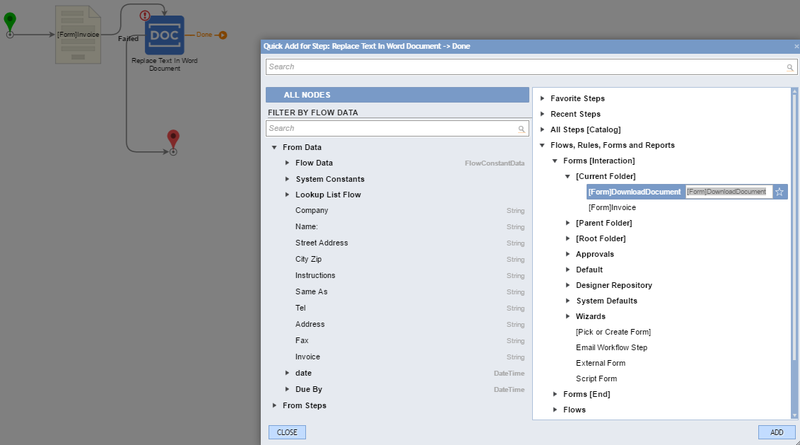 Then, we Name	our Flow and click Create	to proceed to the Flow Designer . 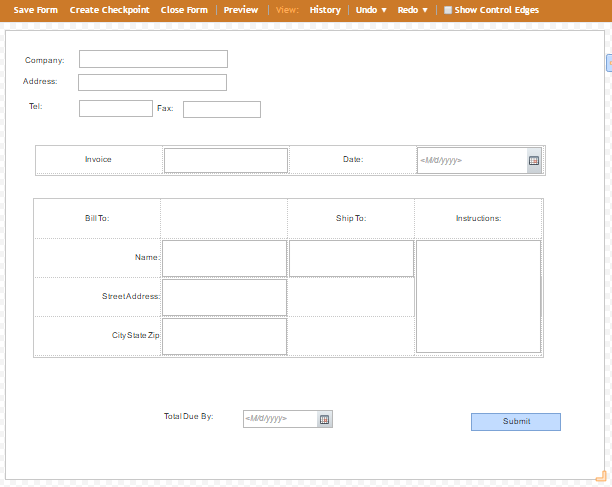 First, in the Flow Designer , we add a form that we have created to take an Invoice	. We will use this Form to get user inputs for our Bookmarks	. In this example we add this Form from Flows, Rules, Forms and Reports > Forms [Interactions] > [Parent Folder] > Replacing Bookmarks With Text	category. This form was designed for Replacing Bookmarks With Text (Dynamic) tutorial. It has Text Boxes	and Date Pickers	for user inputs, and a Submit Button	control to submit the Form . Next, we add Replace Bookmarks With Text	step from All Steps [Catalog] > Data > Documents	category in the Quick Add Step	dialog. We select this step on the workspace and Step Information Layer	pops up. 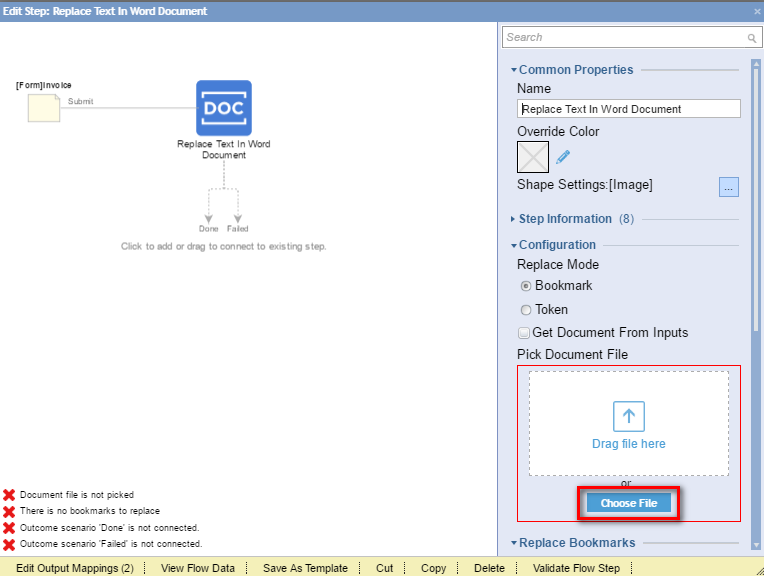 In the Configuration	section we use Pick Document File	selector to pick ourWord Document File. 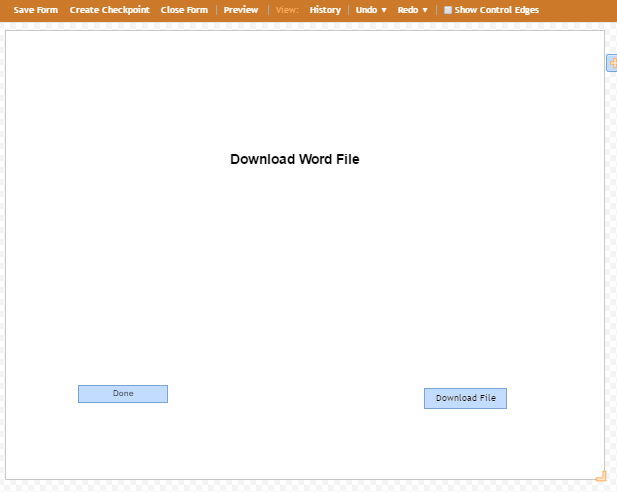 Document File for this Example looks as following. 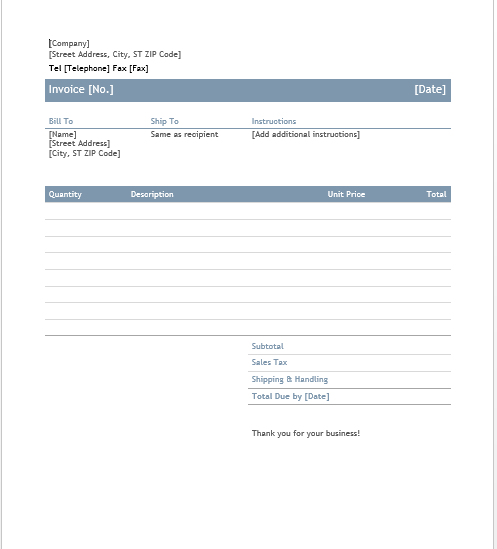 It is a Template for Invoice with Bookmarks	everywhere where text enclosed with square brackets. In the Flow Designer , we select Edit Input Mapping	option from Replace Bookmarks With Text	step’s Options Menu	. 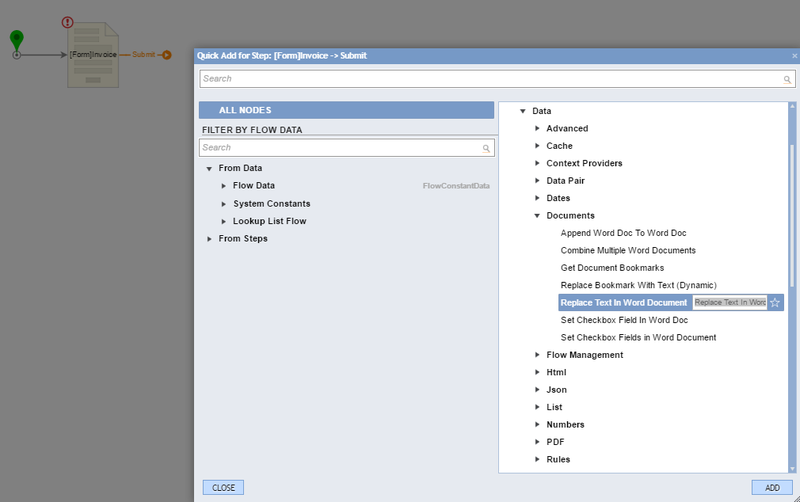 In the Mapping Editor	we connect the Outcome Data Fields from the Form to the respective Bookmark	fields. We click Ok	to save and close Mapping Editor. This Form was designed for Replacing Bookmarks With Text (Dynamic) tutorial. It has two controls. Done Button	control from Actions	category for closing the Form . 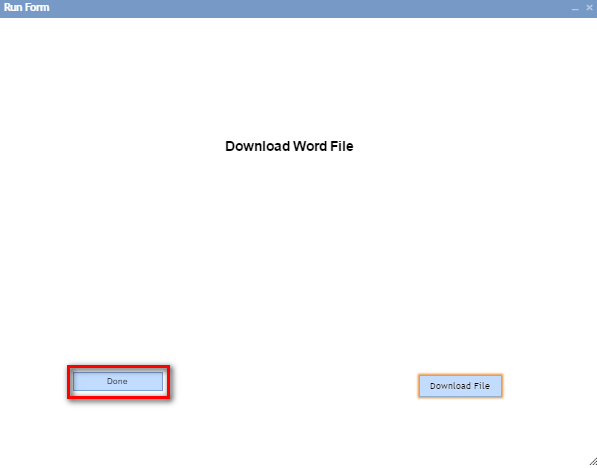 And, Download File Download	control from File Handling	category. Back in the Flow Designer we connect Done	outcome from the Download Document Form	to the End Step	, and Failed	outcome from the Replace Bookmarks With Text	step to the End Step	in our Flow . 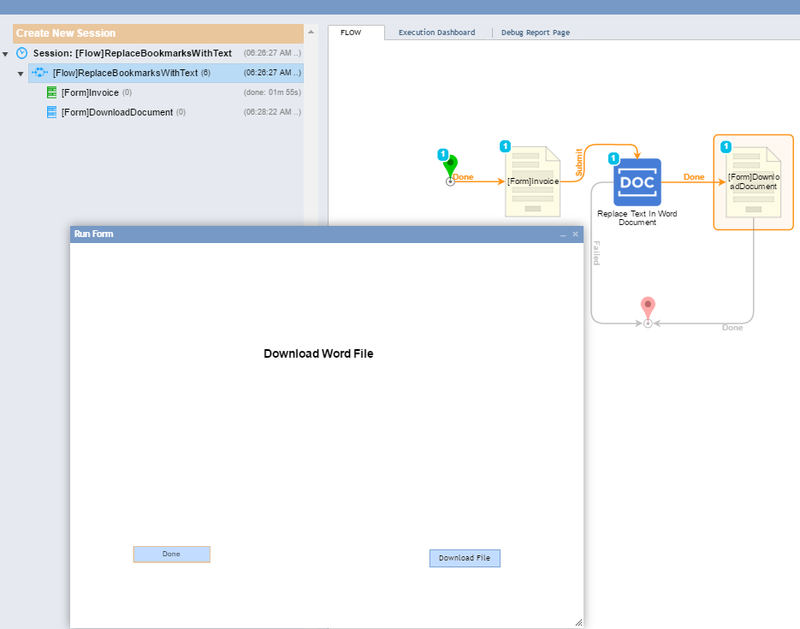 Then, we call Mapping Editor	for our Download Document Form	step. 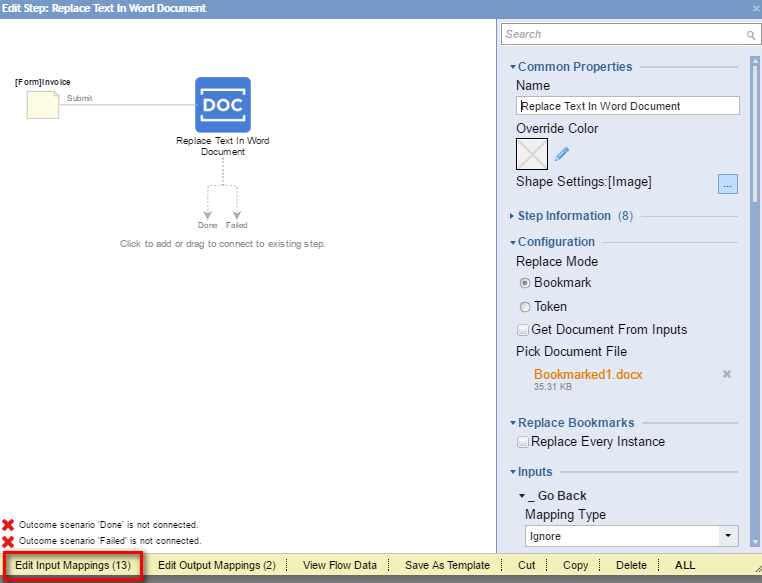 In the Mapping Editor we connect OutputDocumentFile	outcome from the Replace Bookmarks With Text step to the FileHere	File Download control on the Form . Then, we save and close Mapping Editor. Next, we confirm download process, Name	our updated Document file, and save it at the desirable location. Next, we click Done	on the Download Document Form	in the Debugger	. 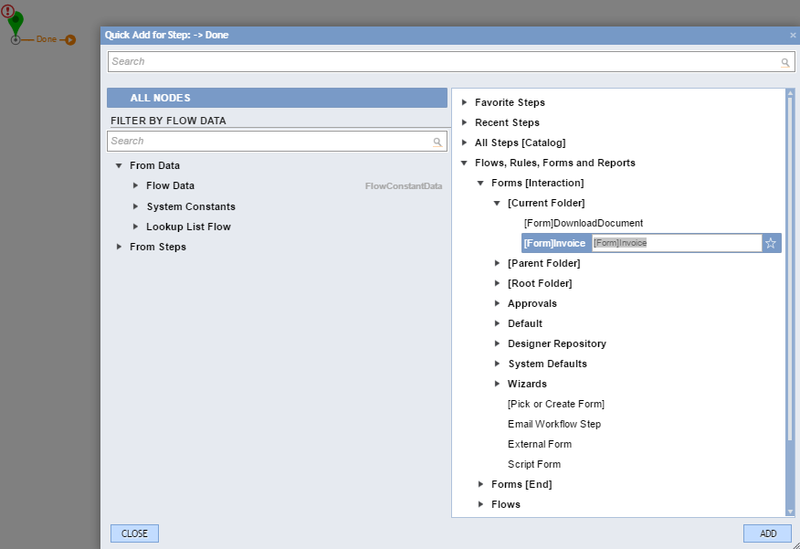 The Form closes and Diagram Tab	in the Debugger	indicates that our Flow ran to the End Step	with no errors. Finally, we locate our downloaded file and open it. We can see that all Bookmarks	were replaced with user’s data from the Invoice Form.